(Reuters) - American Express Co topped Wall Street estimates for third-quarter profit on Thursday and lifted its yearly earnings forecast, as a strengthening U.S. economy powered higher credit card spending. The credit-card issuer said quarterly card customer spending rose 10.3 percent in the United States and 5 percent in overseas markets during the three months ended Sept. 30. Rising wages and a strong economy have fueled U.S. consumer spending, with consumer confidence last month reaching its highest level in 18 years. Payments networks like AmEx and Visa Inc earn fees from merchants every time a consumer swipes a card issued by them. They also make revenue from interest paid by customers on overdue spending. American Express now expects 2018 adjusted earnings of between $7.30 and $7.40 per share, up from the previous $6.90 to $7.30 range. AmEx said third-quarter net income climbed to $1.65 billion from $1.36 billion a year earlier. On a per-share basis, AmEx earned $1.88, compared with $1.51 in the prior-year quarter. Analysts on average had expected $1.77 per share, according to Refinitiv data. Total revenue, net of interest expense, rose 9.2 percent to $10.14 billion, above analysts' estimates of $10.05 billion. 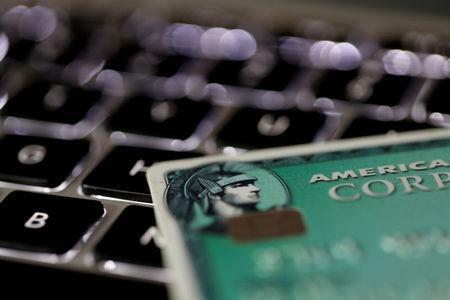 AmEx shares rose 1.6 percent to $104.50 in extended trading on Thursday.